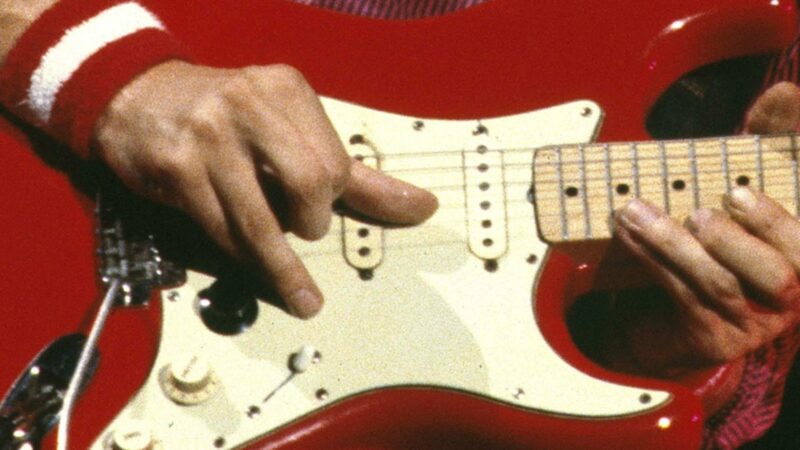 One of Mark Knopfler’s most famous guitars is surely his National Style-O (read “style – oh”). 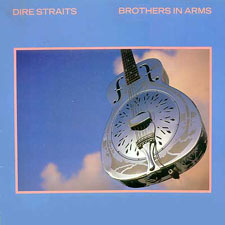 This is the guitar on the cover of Brothers in Arms. AFAIK he bought this guitar from his buddy Steve Phillips long before Dire Straits, it was his second National (the first was a Tricone from the late 20ies which he bought from an old man in Wales). What makes a National unique is not only the metal body but the resonator – something like a mechanical loudspeaker so to say. The first National appeared in the 1920ies, at a time long before electric amplifiers were used for guitars. The resonator increases the volume of the guitar so that it was ideal for street musicians or everyone who had to compete with other instruments in a band. More general info on resonator guitars be found in the Wikipedia article. In this post I want to present some detail photos of a National, a 1936 model that is very similar to Mark Knopfler’s – which seems to be probably from about 1937 to me. This guitar sounds fantastic. I had a metal Dobro guitar which I bought in the late 80ies, thinking that all metal resonator guitars should sound pretty much identical (and there was only Dobro who produced them at that time). When I first heard this guitar however, I immediately decided to sell the Dobro because it sounded miles away from this one. The body is brass (some other Nationals like the Duolians were steel), and the neck might be mahogany (not sure). The neck is extremely fat. It has a V-shape with such a depth that many capos (e.g. my favourite the Shubb capo) do not open wide enough to be used here. The fingerboard is slightly curved what I prefer over the flat ones that were common a few years before. But now enjoy the slide show with a lot of pictures. I will report about some other details of this guitar (including pictures of the interior) in a future article. As you said on your “old” DS guitar page, the national is used on every album, and you quote one song per album. But, before KTGC, there was only one album where this guitar was used on more than one song : the first DS album. Indeed, Mark plays bottleneck on it on Water of love, but he also play it on Wild west end : the rhythm part on left channel, while David plays strumming chords on the right channel. By the way, Mark played the national on BIA tour, while J. Sonni taking the lead. As far as I remember, Wild west end was one of the few songs where Mark “allowed” David to play live his rhythm part. The only over songs that I can check are Setting me up where David try to play a similar riff while Mark playing the solo, and on Southbound again, he also double Mark’s riff at the beginning. But apart this 3 songs, I can’t see others examples where David had to play rhythm parts originally played by Mark in studio. Most of the time, David played his own parts, while Mark combinated his rhythm and lead parts. e.g., on News, David could have played rhythm arpeggios, or on WDYTYG? he could also have played the acoustic intro and Mark ^laying only leads parts. As it said in M. Oldfield book’s, in the DS days, Mark was a bit “dictatorial” and I guess he allowed David to play “interesting” parts only if it was impossible to do another way, like on WWE. Water of Love was probably not this National, but Mark’s other one, a Tricone from the late 20ies/early 30ies. I don’t think that Mark did not allow David to play certain parts, it was rather a combination of (a) that David could not play certain parts that required the MK style and (b) that it was naturally for Mark to play his rhythm / lead combination on stage and rehearsals, just for the studio recording he split it into two different tracks to have a better separation for a clear sound, and to have more control in the mix. Yes I agree with you about the MK style, and the “natural” thing for Mark, but you know what I mean when I say that Mark don’t “allow” the 2nd guitarists to play “his” own parts. others examples : on skateway, it’s also 2 differents parts not composed in one way (like early period) but on stage, of course it was not “acceptable” that Mark played his rhythm style and let Hal take the lead. It’s not a critic, I would have not like that way ! others examples : Boom like that, this is us… Richard played just parts to “fill” the songs, but Mark play the “interesting” parts, and on stage, he prefers don’t have parts that could be played (even if it’s not exactly the same) by Richard, than let him play “his” parts. I think that Silvertown blues was tried in Munich but not played because of this. On the latest records, apart from bouzoukis, Richard is here only to play strumming chords (e.g. boom like that), but not really “important” parts. I think it’s the same for Hal Lindes on LOG : if he was not there on the album, we all know it would sounds exactly the same. Well, it’s very difficult for me to explain what I mean, my english is to bad, but I guess you get the whole idea. if you look at the list of guitars/amps used on Get Lucky, provided by GF, you can see that all “important” and “fun to play” guitar parts are played by Mark. e.g. the rhythm part of Cleaning my gun, on the burn 12 strings (which is mimed by Richard on the video) is played by Mark. I think that Richard only play strummed chords that are not distinguely audible. I guess that if RB would not have play on this album, no one would have heard the difference. As it was for Hal Lindes on LOG, J.Sonni on BIA, or P.Palmer on OES. So I’ve always wonder why Mark has ever have a second guitarist in studio, he could have play all guitar parts alone, and have a rhythm guitarist for touring only . And the funny thing is the last time he decided to do this way (for KTGC), it’s the only album where there’s no iconic rhythm part in Mark’s style. The dire straits model, all right! 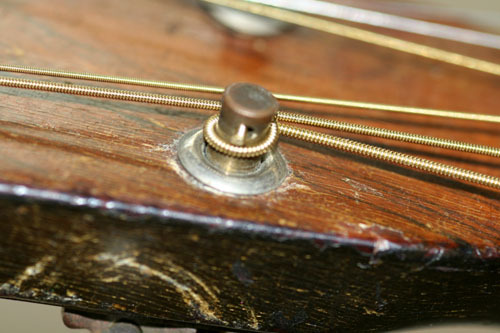 Do you know what stringgauge Mark has ón the National Style O? Is it in anyway modded to make it easier to play fingerpicking? What kind of pickup system is USD? I have a vintage 1937 National Style O-14 for sale. Way better condition than this one. Let you know if youre interested.